One51 has been hell-bent on a flotation since Philip Lynch was running the business and last week it jumped some big hurdles by getting the go-ahead for a reorganisation of the business, paving the way for a listing. Votes representing less than 6pc of the shares were against the motions, which must have been a relief to chief executive Alan Walsh given One51's history of shareholder dissent. The only blip on the day was news that demand from its biggest customer in Ireland had been hit - I believe it is EMC (for whom it makes plastic casing) and its acquisition by Dell has hurt demand. However, something else in the statement raised the eyebrows of seasoned market obervers. When companies are set on a course for the stock exchange, they generally do not end a statement by allowing other possibilities to enter the heads of its shareholders. In its statement, One51 said "in any event" that board "also continues to explore all options ... with the objective of maximising shareholder value and delivering a liquidity event for our shareholders". To the ordinary punter it might seem like business as usual. But many see it as a clear message to would-be buyers that One51 is very much open to offers. CapVest's Seamus Fitzpatrick did not reach an agreement with the now-powerful Canadian shareholders, but the board's door is very much open to anyone else who would like to try and do a deal. Davy has been the talk of the town in recent days as word of a ‘jolly’ to New York spread around the stockbroking community like wildfire. Dozens of Davy brokers were flown to the Big Apple, it appears, with rumours abounding of extravagant meals and entertainment with wives and partners in tow. However, Davy insiders completely played down the trip, claiming that only 30 brokers were at the event and a small number of partners attended, having paid a contribution to costs. Sources close to Davy said the brokers were at BNY Mellon for educational purposes and were “fed and watered” on Wednesday and Thursday, with the rest of the entertainment last weekend left up to individuals. According to the source, the “back-to back-sessions” were for continuous professional development and not the type of sessions rival stockbrokers would have you believe. With the sale of the Examiner to the Irish Times finally signed and sealed, all eyes (in the self-obsessed world of media at least) are on the Sunday Business Post. Owner Key Capital, which bought it out of examinership in 2013, put the paper and its printing press Webprint on the block in September, appointing BDO Corporate Finance to handle the process. To date, only Independent News & Media (INM), publisher of this newspaper, has confirmed its interest in buying the title with chief executive Michael Doorly stating the company would work to overcome any competition issues which could arise. I hear another possible buyer has entered the fray — Irish-American businessman Liam Lynch, who paid €2.7m for Irish Central in 2016, met Business Post representatives last week. Only last month he bought Irish Tatler, U Magazine, Food & Wine and other titles from Norah Casey’s Harmonia group. While some sources are sceptical that he would bite on the Post, he does have a strong leaning towards digital and may see some opportunity there. With Diageo now making moves to develop the unused part of its St James’s Gate site, we can expect lots more activity in the Dublin 8 area. Dublin 8 ripe for gentrification — as any tourists making their way down to the Storehouse can attest. 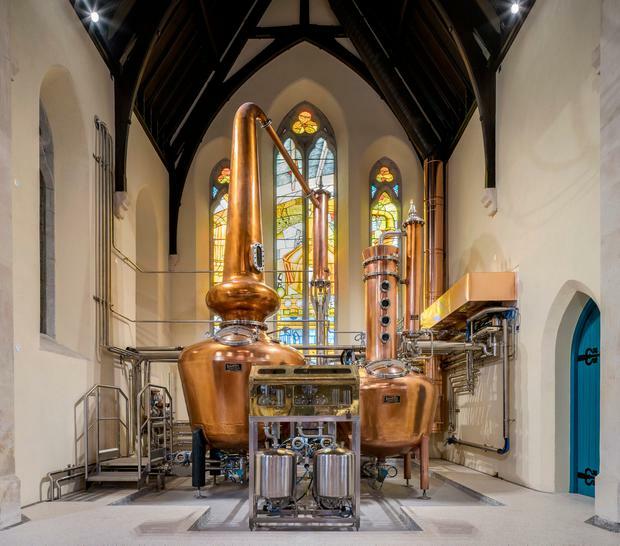 Billionaire Pearse Lyons has already developed a distillery in the area and will go about upgrading some neighbouring buildings. He plans to upgrade 117 to 120 James’s Street, demolishing some less well-finished extensions and amalgamating four buildings and refurbishing them. Vacant units, most recently a hairdressers, offices and bedsits, will be given quite a step up in the world as they will be used, in part, for tearooms under the plan. The boom, Bertie Ahern once said, is getting boomer, or was it boomier? Either way, the boom was back in bucket-loads last Friday afternoon at the Intercontinental — formerly the Four Seasons for those who can’t keep up with the capital’s ever-changing hotel names. No less than 500 corporate titans, bubbly in hand, teemed into the Intercontinental for the Institute of Directors annual Christmas lunch where they were given a festive welcome by IOD chair Michael Somers. With the Brexit deal in hand earlier that morning, the atmosphere was light bordering on dizzy as the crowd was regaled by comedians Barry Murphy (he of the German alter ego Gunther) and Colm O’Regan of Irish Mammies fame. O’Regan specialises in taking his audiences to the edge and sometimes over it. But one quip that went down particularly well was that one about the definition of negative equity — where your home is more valuable than your bank. Oh, how we laughed at that. Well, just about.